Dr. Leonard Sender, left, medical director of UC Irvine’s cancer center and the Cancer Institute at Children’s Hospital of Orange County, visits with Yosef Eliezrie, Moshe Price and Dr. Steve Neudorf, director of Children’s Hospital’s bone marrow transplant program. With hands around each other, heads on their shoulders, and tears streaming down their faces, Yosef Eliezrie of California and Moshe Price of Jerusalem greeted as long-lost brothers. In truth, the two had never met before. The bond they share, however, continues to course through their veins: Last year, Price, a 24-year-old yeshiva student, gave the gift of life to Eliezrie, a 21-year-old rabbinical student, in the form of a blood marrow donation. The emotional ceremony embrace at a Los Angeles hotel this month represented the conclusion of a twisting journey of pain and hope for Yosef and his family. At some points before Price was identified as a match, doctors were unsure of Yosef's chances of surviving. Almost three years ago, Eliezrie, then studying at the Rabbinical College of America, a Chabad-Lubavitch institution in Morristown, N.J., traveled to Lithuania to be a counselor in a Jewish day camp. A few days before his trip, he reported to his doctor with flu-like symptoms, and was given some antibiotics. Things got worse after his arrival. He remained in bed for two days without eating and drinking, and then went to the hospital. Staff performed several blood tests. "I thought that I had a stomach virus," recalled Yosef. "Following the tests, they told me that there were some issues with my blood." They told the young man to fly back home, sending him to the airport in an ambulance. "The hospital phoned us on a Wednesday morning," said Rabbi Dovid Eliezrie, co-director of Chabad-Lubavitch of Yorba Linda. "They told us that our son had leukemia." Upon touching down at Los Angeles International Airport, Yosef was immediately transferred to the medical center at the University of California at Irvine. There, further tests confirmed the diagnosis of leukemia. Two days later, on Shabbat, his condition took a turn for the worse. While Yosef lied in a bed in the intensive care unit, medical personnel informed his parents that their son was in very critical condition and may not survive the coming hours. "The doctor told us to gather the family," said Eliezrie. "These were very hard moments." Miraculously, Yosef pulled through, and even improved a bit. Through it all, the boy and his family held firm in their faith. "Those first days were of great difficulty," said Eliezrie. "But it did not deter our firm belief that G‑d would send him a complete recovery." After nine days, Yosef, who had been attached to life support, opened his eyes and his situation began to stabilize. A regimen of chemotherapy followed for the next 10 months. One evening, Eliezrie read a published letter of the Rebbe, Rabbi Menachem Mendel Schneerson, of righteous memory. In the letter, the Rebbe explained that a doctor is an agent of G‑d whose job is to bring about healing. "The next day," said the rabbi, "we told the doctors about their great Divine gift of preserving life for others." The chemotherapy concluded before Passover, and, slowly, Yosef regained his strength as his life returned to normal. But as the summer neared its conclusion, a blood test turned up an unfavorable result. Further tests confirmed the worst: The boy's cancer had returned. Another round of chemotherapy was ordered, but Yosef's medical team began turning to bone marrow transplantation as a solution. When Yosef was first hospitalized, doctors searched for a match, beginning with the Eliezrie family, and then checking the national donor registry, but nothing came up. Finally, Israel's national registry, Ezer Mizion, came through with a perfect match. Yosef was admitted to Children's Hospital, where doctors stepped up their chemotherapy and radiation treatments to kill off Yosef's bone marrow cells, laying the groundwork for the transplant. Through it all, Yosef continued his religious life as if all was normal. While in bed, he always wore his skullcap and tzitzit, the ritual fringes mentioned in the Torah. He put tefillin on daily. For the holidays, he always made a point of being cheerful. "Yosef was extremely weak from all the treatments," said Stella Eliezrie, his mother, about that year's holiday of Simchat Torah. "But he never gave up on the joy of the holiday." His friends came to the hospital with a Torah scroll to dance around Yosef's room. When it came time for Chanukah, Dr. Gene Spiritus, the senior medical director at the UCI Medical Center, allowed Yosef to light a menorah on the condition that a firefighter be present in the room. During this time, Yosef decided to ignore his condition and devote his time to build a Web site to raise funds for the residents of Sderot, Israel, who have been living under the constant threat of missile attacks from Palestinians in the Gaza Strip. The site Yosef came up with teaches people about the situation in the city, while showcasing the work of Chabad-Lubavitch emissaries in bringing hope to its residents. Finally, a sample from an anonymous donor in Israel arrived and was slowly introduced into Yosef's system. The operation was pronounced a success, and after spending almost two months recovering, Yosef was released from the hospital to live a normal life. "My life was saved," stated Yosef. "I feel that life was given to me as a present." The identity of the donor would remain a mystery for more than a year, a requirement of Ezer Mizion's policies that govern the release of confidential information. 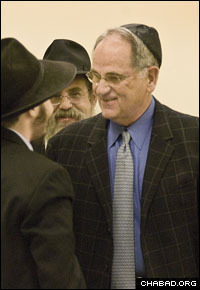 Yosef Eliezrie and Moshe Price meet for the first time. After the year was up, both Price and Yosef independently sought to learn the identity of the other. Price, who, four years earlier, had walked into Ezer Mizion's offices to have his blood tested and his named entered into a database, had prayed constantly that the recipient of his marrow had survived. The Israeli student, now married, said that he urges others to sign up as donors. "It is simple and it could save lives," he said. "I became very emotional when I received the phone call [that a leukemia patient needed a donation]. I cannot explain what went through me at the time. "All I knew was that it was someone from outside of Israel," he added. After the requisite year had passed, both of them filled out the necessary paperwork allowing their identities to be revealed. Yosef called first, and the two spoke for nearly two-and-a-half hours. They communicated daily after that, and when Price told Yosef that he was coming to the United States to spend Passover with his wife's family in Baltimore, the recipient invited his savior to meet him in California. The two students met each other in a hotel lobby, and the next day, went for a tour of the hospital where Yosef spent so much time. Afterwards, the Eliezrie family hosted a seudat hodaah, or feast of thanksgiving, at the North County Chabad Center in Yorba Linda. "One cannot describe what it is to meet someone who saved your life," said Yosef. "I will never forget that moment," added Price. Yosef's father said that coming back to Children's Hospital to celebrate with some 30 doctors, nurses and medical staff was deeply moving. "We came early," said the rabbi. "We passed by the third floor. The walls were so familiar. "There was Yosef's bed," he continued. "Thank G‑d it was empty. Our Yosef was not there. I cannot explain that feeling. Price said that he and Yosef share a very strong bond. "We are like family," he explained. "We are blood brothers." A version of this article first appeared in Hebrew in the Kfar Chabad Magazine.